SHIPPING: $4 for first item. $2 extra for each additional item. 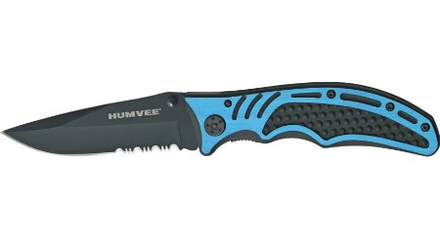 Humvee Gear – Part Serrated Apollo Folder Linerlock Knife with Black Finish Aluminum Handles. Black finish aluminum handles with grip ridges and blue aluminum overlay trim. Black finish stainless pocket clip.